It’s All Settled Now! Antidepressants Work. Or Do They? It's All Settled Now! Antidepressants Work. Or Do They? "...SSRIs work. They may not work for every patient, but they work for most patients. And it's a pity if their use is discouraged because of newspaper reports." "The finding that both paroxetine and citalopram are clearly superior to placebo...when not producing adverse events, as well as the lack of association between adverse event severity and response, argue against the theory that antidepressants outperform placebo solely or largely because of their side effects...."
"...our results indirectly support the notion that the two drugs under study do display genuine antidepressant effects caused by their pharmacodynamics properties." "And we did have an impressive, robust difference between active drug and placebo...."
The dark blue group would represent the people who took the SSRIs. The light blue represents the placebo group. One can see that the average level of depression for the SSRI group is less than that of the placebo group. But look at how much the two groups overlap. Given the range of effect sizes in the study, 80-88% of the two groups would overlap. This means many people in the placebo group did better than people in the SSRI group, and many people in the SSRI group did worse than the people in the placebo group! With this in mind, how could the above claims of SSRI superiority be justified? They can't. This bold sounding announcement that the question has been finally settled about SSRIs' superior effectiveness is typical of those who continue to support the medical model of human suffering. They use statistics to obscure practical and clinical significance. Looks good in medical journals and unless one understands the basics of statistical analyses (in most cases, the effect size is the telling number), it sounds good in media reports too. 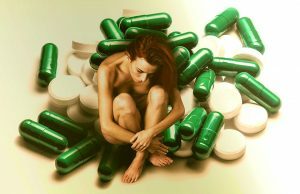 The article mentions Irving Kirsch, Ph.D., who has critiqued the use of SSRIs (as have many others). Dr. Kirsch rightly points out another little known issue with studies like these. Not only is a placebo effect likely just because someone knows they are taking a substance (and they think it is the SSRI), but also because those taking the real SSRI will notice the psychoactive effects of the real chemical, and this will enhance the placebo effect. So, one would expect a small effect size difference between the SSRI and placebo group based on this alone. This is exactly what the study shows. Dr. Kirsch cautions that we should weigh this small, meaningless, effect with the potentially harmful side effects of taking these and other drugs to quell human emotional struggles, typically in combinations with other psychoactive drugs. These above issues make this announcement weak. The study is far from demonstrating that SSRIs, or any other psychoactive drug, is an effective way to address the meaning-laden and personal struggle we call depression. Chuck...I agree that big pharm, over reliance on meds exclusively, and "the medical model mentality" are insidious. Thanks for keeping an eye out for misleading information. Hope to see you at the annual conference. Terry - I also want to challenge your interpretation of the effect size results. The claim that "people who took the anti-depressants under study did fair better than those who did not" is not justified by the study's data. The placebo and SSRI group overlap greatly. You are correct there would be a 100% overlap if there was no effect size. But with the effect size in the study there was still an 80-88% overlap. This overlap shows that not all people in the SSRI group faired better than all people in the placebo group. Only some did, and not that many. For instance, all of the light blue area to the left of the dark blue average line did better than the average of the SSRI group. Terry - Thanks for your comments. I am not anti-drugs. I am pro-informed-consent. If a person (as you did) choose to use psych drugs or even recreational drugs to aid in recovery, I have no problem with that. But the way these studies are announced both in the media and in scholarly journals are misleading. They make it sound like the drugs are curing something or targeting an illness - in this case called "depression". Nothing could be further from the truth. They are having chemical effects on experience and if those experiential effects are useful to the person, I'm all in for that. The problem is that even though a few people (as the study demonstrates) might benefit, there are a lot more who suffer from the drugs and that is downplayed.